Touchscreen ATM For Kids | OhGizmo! Is teaching kids to use an ATM at a young age a good thing or a bad thing? 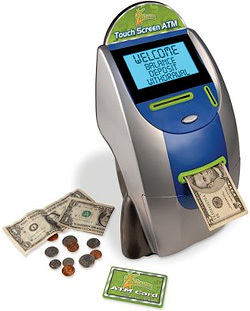 This 21st century version of the piggy bank looks and functions like a real ATM and comes complete with a backlit touchscreen that can be operated with a finger or with an included stylus. I assume the stylus option is an attempt to keep the screen clean from those kids who walk around with sticky fingers all day. But if the intent is to recreate the experience of using a real ATM they should let it get as dirty as possible and should also include a hobo sleeping underneath it. The bank even uses a plastic ATM card with a custom PIN number which allows the child to make deposits, withdrawals and even check their account balance. But unlike a real bank the savings account is actually limited to $999.99 which might discourage any 8 year old entrepreneurs. This is a creative way to save your money and have fun with your own atm machine! I’ve always wanted one. Gotta love novelty banks.